Shoot for several hours with a big camera, and “pain in the neck” becomes more of a literal statement than a metaphor. Neck straps may be a necessary evil, but the Cotton Carrier EV-1 StrapShot ($79) makes an improvement to the way photographers have been slinging around cameras for decades — by securing the camera onto the strap of a backpack, rather than over the head. Find out in our Cotton Carrier EV-1 StrapShot review how it takes the load off your neck, yet it remains easily accessible. 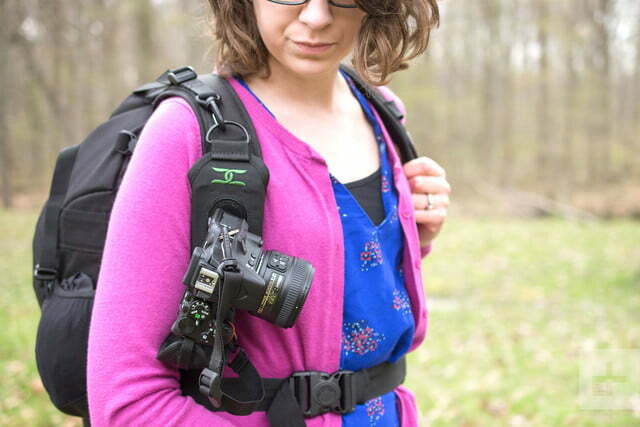 Think of the StrapShot as a quick release plate for your backpack, belt, or any strap you can attach it to. To remove the camera, you simply need to turn it and detach from the StrapShot. When you’re done shooting, just slot it back into the holster and twist to lock. 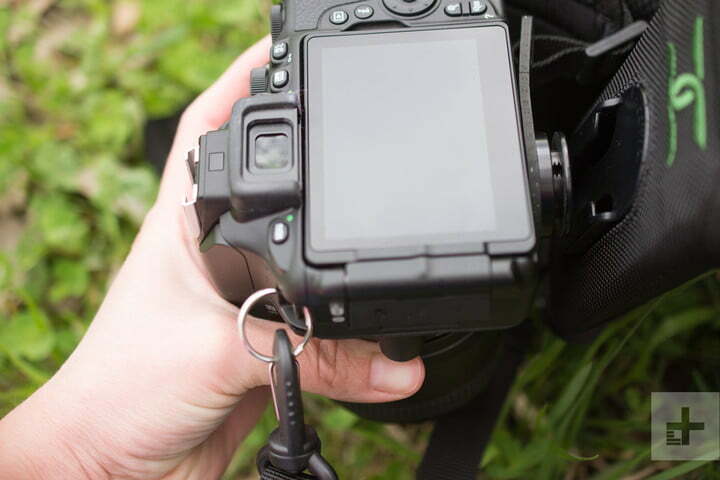 A leash (safety tether) prevents disastrous drops from happening, while a wrist strap makes grabbing the camera both comfortable and quick. 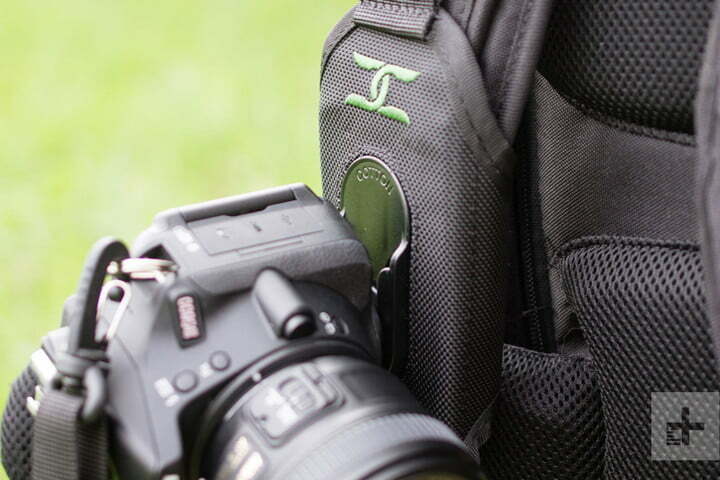 The holster base wraps around a backpack shoulder strap — the ideal placement – with Velcro. 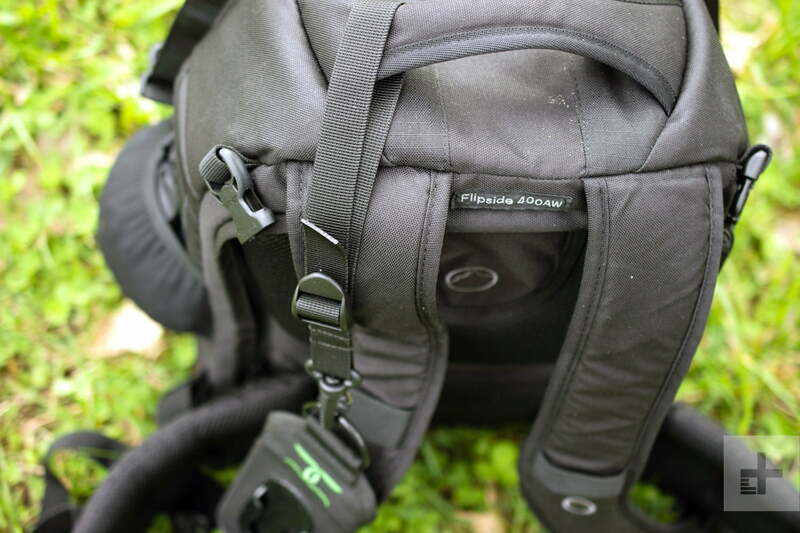 In addition, there is a strap that attaches to the top handle that’s standard on almost every backpack. On the bottom of the base, the safety tether attaches to the camera. With these two components, the StrapShot system makes sure your camera doesn’t hit the floor — as long as you’re in a standing position. The camera attaches and locks into the holster via a circular piece, called a hub, that screws into the camera’s tripod socket. The hub slides into the plastic insert that’s within the base. With the lens pointed to one side, the camera is unlocked and ready to slide out, and with the lens points down, the camera is securely locked into the holster. 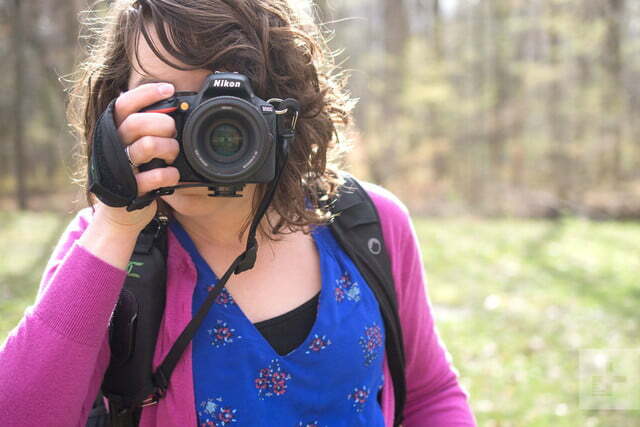 If you’re hiking, biking, or sprinting to get the shot, the camera isn’t going to bounce around. Setup, at first, took several minutes — not because of bad design, but there are few instructions on how to properly put it together. 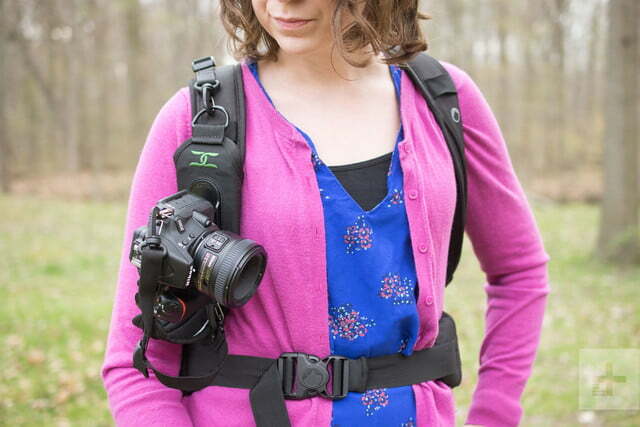 Only after watching some YouTube videos, we had the top strap successfully looped through the top handle of a backpack, and Velcro-secured the holster to a shoulder strap. 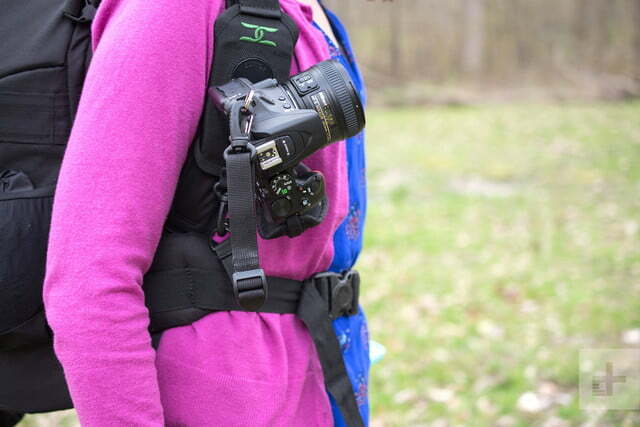 The included wrist strap, which isn’t a necessary component of the holster, attaches to one of the camera’s metal neck strap loops (with Velcro) and tripod socket at the bottom (using the hub). 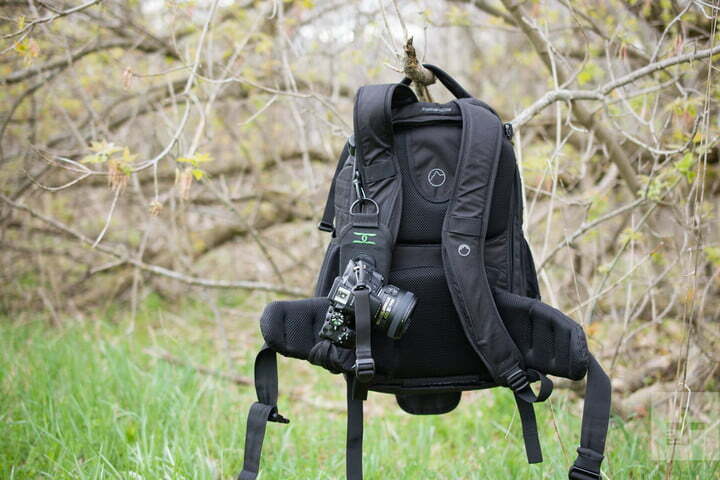 Both the top strap and camera leash are adjustable, so you can pull the top strap tight or loosen it to get the camera to sit comfortably on the backpack strap while against your chest. If you want more freedom of movement when pulling the camera to your eye, you can lengthen the camera leash, or shorten it to keep the extra strap out of the way. The system could also be used without the leash for strap-free photographers who like to live dangerously on the edge. The StrapShot is made out of the same canvas used to construct many camera bags. The system feels both sturdy and durable — once we had the system set up we weren’t worried about whether the straps would hold the weight of the camera. We used the StrapShot on a hiking-style camera bag, a large bag that carried two camera bodies and several lenses, with a mid-range DSLR and a small to mid-sized lens attached. Whether it’s a double-strap or single-strap crossover, as long as the backpack you use has a top handle or some sort of loop to secure the StrapShot’s top strap to, it’s compatible. Wearing the StrapShot is just as comfortable as wearing a backpack. There’s no additional pull or strain on your neck, and we didn’t notice any new aches and pains from the added weight on one shoulder strap. We didn’t feel lopsided with the weight of the camera to one side, although we were a bit more conscious in crowds and tight spaces about allowing a few extra inches to avoid bumping the camera into anything. Secured to the strap, the camera doesn’t bounce around like it would with a normal neck strap. If you’re hiking, biking, or maybe just sprinting to get the shot, the camera stays put as you move. This reviewer used the StrapShot to secure a second camera while shooting a wedding, with another camera worn around the neck. This is preferred over using a dual-camera harness because there weren’t two cameras oddly dangling underneath the arms. The second camera was always readily available, both cameras didn’t bounce against each other, and it was incredibly comfortable for shooting with two cameras while also wearing a full backpack. The StrapShot has two big things going for it: It keeps the camera weight off your neck, and it keeps the camera from bouncing around during active shoots. 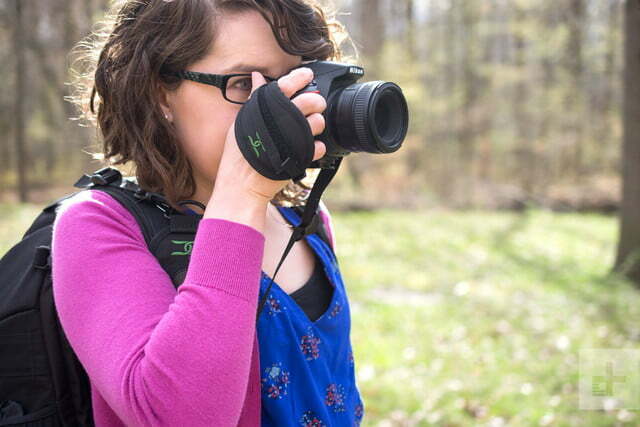 The camera holster is comfortable, secure, and quick to access, hitting all the “musts” for a camera strap system. The backpack mount and minimal-bounce fit makes it ideal for active photographers, whether that’s hiking, biking, or even shooting a wedding. Listing for $79, the price also isn’t bad considering the comfort and unique design. While $79 isn’t too much to ask, the price goes up when you add optional accessories. If you don’t want to use a backpack, for example, the StrapShot is compatible with Cotton Carrier’s Wanderer Holster ($49), Endeavor Holster ($89), and harness vests (starting at $119), but you up the price significantly. 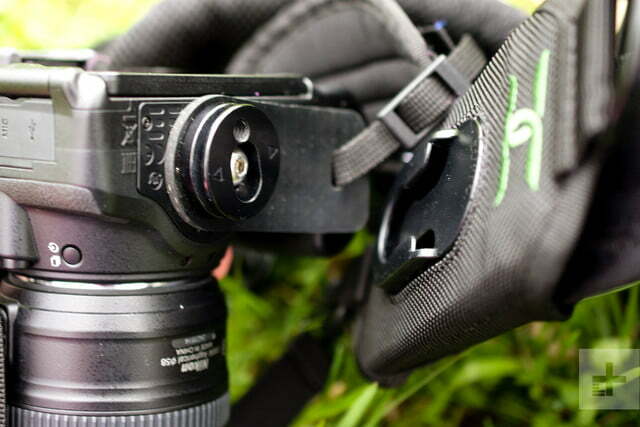 Want to use the StrapShot with your tripod? You’ll need to spend $39 for the Universal Adapter Plate. The concept isn’t a completely new one. Peak Design has aluminum clips that work with belts or backpacks, but if you want a wrist strap and a leash with it to prevent drops, it will run almost $140. Spider also makes a backpack adapter and holster for about $65, but the design requires two hands to release the camera from the holster. Some camera backpack companies like Think Tank also offer strap systems, but these aren’t universal across every backpack. So, when compared to what else is out there the StrapShot is the most ideal in terms of usage, construction, and price.